A nice brown leather dog collar that is lined with soft calfskin. The collar is trimmed with three rows of spikes. 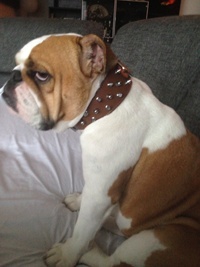 This sturdy looking and solid collar for larger dogs is made of brown double layered leather. Your dog will look good with the three rows of spikes. Of course this dog collar is lined with soft calf leather for extra comfort for your loyal pet. This dog collar is also available in black leather .